A very rare, impossible to find early PEPLUM/Swashbuckler starring perennial genre star Massimo Serato. Gary has been communicating with me with rare difficult stuff impossible to find from the genre and this is one of them. 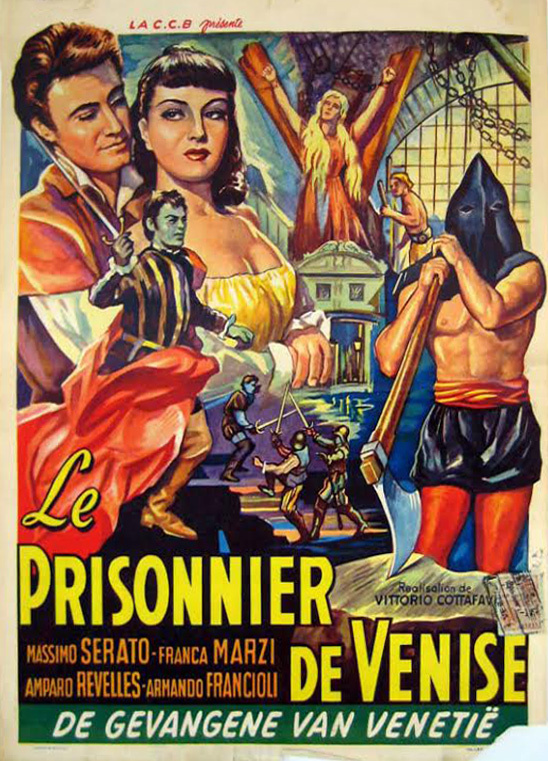 The Italian is untranslatable but the Belgian title here, LE PRISONNIER DE VENISE is easy to figure out: THE PRISONER OF VENICE. The French title translates as THE EXECUTIONER OF VENICE. That title already exists as a Lex Barker actioned made in the 1960s. The film's production manager was Vittorio Cottafavi who later on directed many famous films of the genre. The poster includes all the trademark genre elements.